This C T S Control Pot is a great option for noticeable results from an easy modification or upgrade. Most players will be able to gain a more precise response to manipulation with these split-shaft pots. These will work with most fine knurled, 24-spline style knobs. This is a large, long-shaft, body mount control pot. If you are mounting through a pickguard, you may need additional nuts or lock washers (not included). Of course, your set-up may be different. Be sure to check your requirements in relation to the measurements provided for this item. Ask any fit or compatibility questions prior to purchase. Audio Taper (“A” pot) or Linear Taper (“B” pot) styles are available. Players will often use B Pots for volume and A pots for tone, but it’s a personal playing preference. 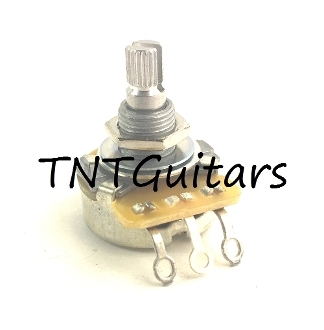 We also offer your choice of OHM style: 250K or 500K. A control potentiometer is a variable resistor controlling the signal strength. “K” is the reference to the resistance rating of the pot (kOhms). Higher pot 500K values typically lend a brightness to your sound while the 250K lower value pots typically result in a bit more playing warmth. Many players prefer pairing humbuckers with 500K pots and single coils pickups with 250K pots. You might switch it up depending on your style and what you are looking for in terms of performance. Be sure to check your measurements carefully to see if this item will work for your set-up. ASK ANY QUESTIONS PRIOR TO PURCHASE. Instructions for installation are NOT INCLUDED or provided. Inspect your order upon receipt; we pledge to address any issues PRIOR to installation.